The Vault is not a great movie. Whether it’s the technical aspect or the dramaturgical flow, it does not live up to a clever supernatural, heist-gone-wrong concept. You know the drill: A group of ne’er-do-wells attempt a caper, hostages are taken, cops arrive, everybody is trapped, and so on, and so forth. 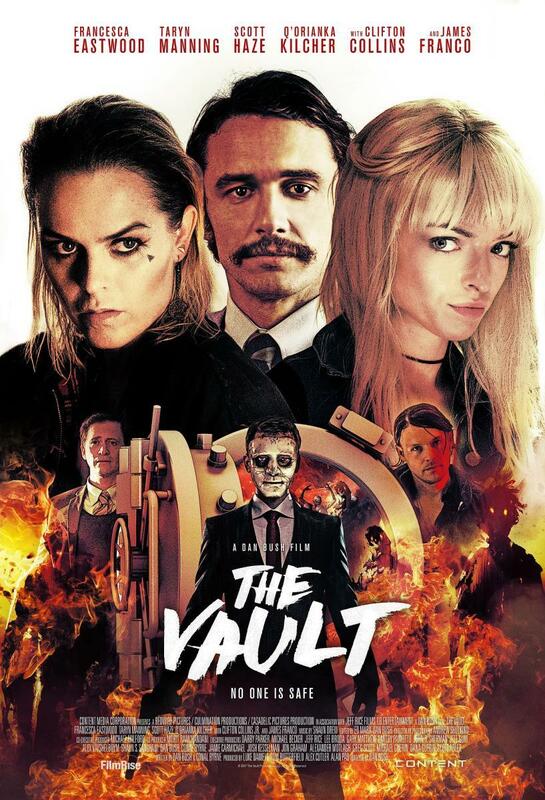 But here’s the twist: The robbers learn from an assistant manager — James Franco, donning a ’stache for the ages — that the basement vault holds a vast cash reserve. The haunted basement. It’s slock in a Tales from the Crypt kind of way. The backstory of victims from a botched 1982 robbery haunting the bank, that whole thing. Lessons will be learned. Conceptually, I find it entertaining. It’s the execution that leaves something — a lot — to be desired. First, Franco. It’s painfully apparent his scenes were filmed separately from the rest of the cast. His performance mostly consists of sitting in a corner, looking nervously at the surveillance videos. Only a handful of times do we see him interact with other actors. It’s jarring. Threads go unresolved, and I don’t mean that in the artistic sense. Rather, the writers and director seem to have forgotten about them. The story of what happened in ’82 is hastily laid out, without the details needed to set up present event, particularly related to one key character. As for the twist ending, which is set up in one of the earliest scenes, it’s something you’ll have figured out before you even know there will be a twist. It’s bizarre, but it’s all but spelled out in the opening credits, and when paired with the final scene, it’s like you’ve watched two different movies combined into one. I’m still not sure if a caper film and a horror movie were hastily edited together, with a few additional scenes added as glue. On the positive side, Taryn Manning (you know her as Pennsatucky in Orange Is The New Black), and Francesca Eastwood (not no relations) are stand-outs as off-kilter sisters who are in over their heads. The man in the white mask, too, is appropriately creepy. It could have been a Tales from the Crypt homage of some class, but The Vault doesn’t bring home the bacon. Entertaining to a point, but it should have been so much more.